The title raises the obvious question: Does Chicago need saving? I guess the answer is clear. Aaron Renn published a reviewofthe 2010 census, and for Chicago it was not pretty. Since 2000 the city lost over 200,000 people: nearly 7.5% of its Black residents, and almost 6% on non-Hispanic Whites. Only the Hispanic population grew, but at an anemic 3.4%. Even the metro area writ large isn’t doing all that well, growing by only 3.9% (against the nation’s 10%). Los Angeles, described as “a city in secular decline" appealed to the schadenfreude in my heart. As a Chicago booster, the decline of an arch-rival is emotionally (if irrationally) satisfying. But sadly, many of LA’s problems are Chicago’s issues as well: a decline of the central business district, an exodus of major businesses, the disproportionate influence of real estate on local politics, and ethnic politics. Add to that a still vibrant Outfit (mob), a lousy climate, and apart from Lake Michigan, little in the way of natural distinction, and you don’t have a pretty picture. Even some gentrification seems to be wearing thin. Walking along Clark St. there are plenty of empty store fronts. It’s beginning to look a little dreary (though still far from a slum). That all sounds pretty desperate. But there is some good news as well. Public transport is alive and well in Chicago. Trains and buses are clean, graffiti-free, and the passengers are civilized. There is lots of affordable housing. Plenty of “luxury apartments” are for rent along Clark St. One can buy a perfectly nice condo for $100K or less. Many neighborhoods have been redeveloped and are really nice; Logan Square is a good example. This is the good side of the real estate bust, and gives the city a huge advantage over, say, New York or San Francisco. Lakeshore Drive, Michigan Avenue, Wacker Drive, and even State Street are as fabulous as ever, especially in nice weather. So there is hope, but the patient is sick, and if things don’t change then Chicago could go the way of St. Louis or Detroit. So how can Chicago be saved? Here is my advice to Rahm Emanuel, the new Mayor. Forget about the old business model – the world has changed. The days of small-time manufacturing or major banking centers are over. The notion that The Loop is going to be the home of large corporations is past. So concentrate on the new world: what can Chicago do well? I count three things: Residential, Retail, and Tourism. And Chicago has (quite inadvertently) done the residential part right. It’s the other stuff that needs attention. Remember why Sears Roebuck started in Chicago: it was the center of the country. The Windy City is still is the center of the country. It should have the World’s Busiest Airport. It still is the railroad capital of America. It could be the retail capital of America. 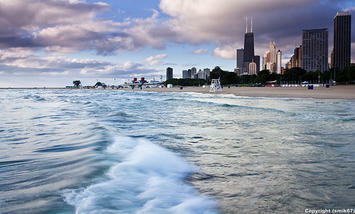 Chicago – The Loop, Michigan Avenue, Woodfield Mall, all of it – can be where America comes to shop. If relative pipsqueak Minneapolis can make a success of the Mall of America, just think what Chicago can do. Maintain the neighborhoods. I know the stockyards are long gone, but where is that really good steakhouse in Bridgeport? Likewise, I’m happy to drive to 87th and Stony Island for dinner and good music, but you need to ensure my safety. The city doesn’t need more real estate - it needs more cops, public transit, art, advertising, and street lights. Free parking on Sundays. I know the city has taken a lot of flak for parking, but in principle it works. I parked within a couple of blocks of a fancy restaurant on Rush St. on a Friday night ($6). I parked within a block of Clark & Diversey so my wife could go shopping ($2). Before the new meters I would have had to drive around for an hour to find a place to park, and then it’d be many blocks away. Now it’s easy, and (compared to wasting time and gas) not expensive. But free parking on Sundays would bring them in from the suburbs in droves! New York does that, and that’s the only day we drive down to the City. Cut folks a break – it’s good business. Improve public transit. That doesn’t mean new trains, but it does mean more safety. Let me take the train to Chinatown at night and have it be an enjoyable experience. Where is the convenient bus to Hyde Park? Why can’t I buy a tourist day-pass or a weekend pass for the CTA at my local station? And why do the ticket vending machines not accept credit cards? Oh, and if you do have an extra train or two, why not run A and B express trains on the Red Line? They did that 25 years ago. Keep the cows. I don’t mean the stockyards, I mean the art. Of course the actual street-corner cows are passe, but Marilyn Monroe isn’t – she works. Use your architecture, your waterfront, your grand vistas. Use your imagination. Here is the key: for Mayor Emanuel and for all politicians. The citizens have to earn money before you can tax it. Exorbitant sales taxes just spoil it for everybody. Yes, I know you need to spend money on schools and welfare and public-employee pensions. But you can’t do that if the money isn’t there in the first place. So get Chicago open for business. Lower sales taxes. Ensure public safety downtown and in the neighborhoods. Invest a little in mass transit. Give up just a bit of the parking revenue. Chicago is a great tourist and shopping destination, better than Rome in every way except ruins. Allow your citizens to cash in before Chicago itself becomes a ruin. Submitted by ymouel on Mon, 05/25/2015 - 08:13. Submitted by arceeboyDladiesman on Wed, 04/29/2015 - 01:59. Submitted by faren on Sat, 03/14/2015 - 02:28. Submitted by al4sk4 on Wed, 01/21/2015 - 20:35. Submitted by albertgitu on Sat, 09/20/2014 - 10:57. Submitted by quangstar on Wed, 08/13/2014 - 00:05. Submitted by thscp1122 on Tue, 07/01/2014 - 06:18. Submitted by paulgantt on Fri, 07/11/2014 - 00:42. Submitted by helmet on Mon, 05/05/2014 - 03:07. I really liked it. Keep sharing such excellent post like this in future too. Informative and good article. I like it very much. I gained so much information in this site and also it gives us new insight about the topic that is being discussed. Have very interesting content to read out. Submitted by Altono007 on Sun, 11/24/2013 - 01:54.